TURN DRAMA TO DESTINY, PAIN TO PURPOSE, ANY MESS TO A MESSAGE OF HOPE! Turn your drama to destiny, your pain to purpose, your mess to a message of hope and success in Christ. Turn your trials, trouble, and tragedies to Triumph through turning to Jesus Christ in everything. He has a good plan for your life. Dare to take your own leap of faith…connect with people of purpose, praying people, and learn what God has put in your heart to do WITH HIM. He may want you to start a new business, open a center for abused women, men, or children, or run for political office. No matter what He says to do, obey His instruction. The thing that makes you the angriest in life and touches your heart, is one way to tell what God has anointed you to do as you partner with Him. Learn how to overcome through turning to God’s Word and understanding how Satan works to destroy. GOD’S PRICELESS TREASURE (How To Overcome Challenges, Be Transformed And Know Your Purpose) will help you move forward to healing. Learn to take your own leap of faith and learn to hear the voice of God. You will be encouraged, inspired, and have increased faith to step out and do something awesome with God leading you every step of the way. “Beloved, I wish above all things that thou mayest prosper and be in health, even as thy soul prospereth” (3 John 2 KJV). Connect with Deborah on www.starministriesinc.com for further teachings, encouragement, books, and ministry or speaking engagements. 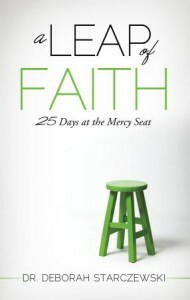 A LEAP OF FAITH (25 Days At The Mercy Seat)…God raised my husband from death, healed him from two open-heart surgeries, healed him from two strokes; and how the Holy Spirit led us will inspire you to seek God more, to learn to hear Him better, and to stand in the gap for yourself, family, friends, and enemies. THE MIDNIGHT HOUR (Will America Turn Back To God? )…a must read for all. Available on Amazon, Barnes & Noble, www.starministriesinc.com and other distributors. TAKE YOUR OWN LEAP OF FAITH TODAY! If I had not believed God, my husband would not be alive today. God raised him from death, healed him from two strokes, and two open-heart surgeries. Yes, and twenty-five days in Mercy hospital…with a stop sign at the street corner that was strategically placed by God that said: STOP WORRYING. 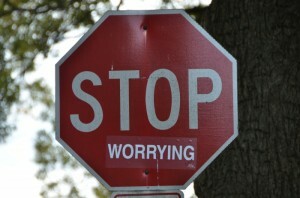 Someone had gone before us and had put a sticker that said “worrying” underneath the word STOP. God goes to extreme measures to encourage us. Trust Him today. If I had not stepped out and asked questions, stated what God told me to say, and had the boldness to stand up—I would have been a widow. Dare to step out and identify your gift, dream big dreams, connect with people of purpose, live large, empower people to do the same, promote other people, and live the abundant life through caring about people and obeying God. Choose to leave a legacy of knowing God and making Him known in every area of your life. God still raises the dead. He parted the Red Sea and He will part whatever Red Sea is facing you today. Dare to believe. 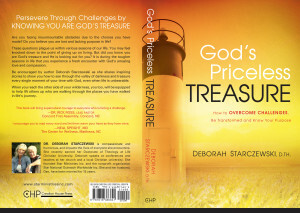 GOD’S PRICELESS TREASURE (How To Overcome Challenges, Be Transformed And Know Your Purpose)….drama to destiny, pain to purpose, a mess to a message, trial and tragedy to triumphant living through Christ. A LEAP OF FAITH (25 Days At The Mercy Seat)…the full account of all the miracles…God raised my husband from death, healed him from two strokes..and walked with us through 25 days at Mercy and two open-heart surgeries. A modern day miracle that will give you faith to believe. THE MIDNIGHT HOUR (Will America Turn Back To God? )…a must read for ALL! While pain may push us to pursue purpose, and any mess may turn into a message, our foundation must be in JESUS CHRIST and HIM ALONE. In my first book, GOD’S PRICELESS TREASURE (How To Overcome Challenges, Be Transformed and Know Your Purpose), the message the Holy Spirit gave me is this: PAIN: Pain aligns us IN NEED of God. It is only God who can save us and make us whole. When any of us are stricken with some crushing pain, crisis, hardship, or trial and we don’t know what to do, it is paramount to remember the words of Jeremiah: “I know, O Lord, that a man’s life is not his own; it is not for man to direct his steps.” (Jeremiah 10:23). The absolute worst thing we can do in times of trouble is to make hasty decisions and to take whatever course of action seems easiest at the time. Remember, God has promised to lead us. In 1 Samuel 30, David was in extreme duress and had wept till he had no strength left. All those with him did the same. You can read the story. Even those around him wanted to stone him, but David encouraged himself in the Lord, chose to worship, inquired of God and God gave David specific instructions. David obeyed and recovered all. (*Note: … those with him wanted to stone him and out of all of those men, David was the only one mentioned that turned to the Lord). Time doesn’t heal our wounds; it is in turning to the LORD where we find strength and help in times of trouble. We must remember that our life is not our own, and that God has promised to lead us. I don’t know what you are facing, but God does. Turn to Him and He will give you direction. He will direct your steps. If you sense a small unsettling nudge in your heart, don’t ignore it. It may save your life and future. You may be seeing injustice all around you and sense God nudging you to step out into a new career to be the change. You may be facing a business decision and need help from God and clarity. You may be deciding which job to take, where to move, or what church to connect with in a new city. One thing I know for sure, God will lead you. He will also connect you will people to help you succeed as a team. A LEAP OF FAITH (25 Days At The Mercy Seat)…the miraculous account of God raising my husband from death, healing him from two strokes, and two open-heart surgeries. The story will keep you turning the pages, give you encouragement, and increase your faith to believe God for whatever you are facing. THE MIDNIGHT HOUR (Will America Turn Back To God? )…a must read for all. A great devotional type read…the perfect gift for family, friends, and co-workers. Contact Deborah at www.starministriesinc.com for speaking and ministry engagements. "...As a result of obedience in the midst of her desert experiences, I believe God has filled Deborah with wisdom that we would all do well to take to heart. Do you ever ask yourself why you seem to end up in the same situation over and over again? Why you fear the future, or are frustrated with relationships?...."